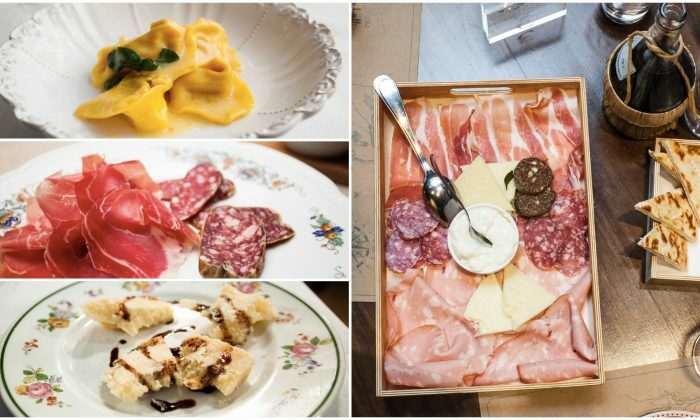 If good things come to those who wait, the good people of Emilia-Romagna, in northern Italy, must have the patience of saints—they certainly feast like royalty. To turn raw ingredients like milk, grape must, or leg of pork into these delicious, iconic foods, give them time. Parmigiano-Reggiano and prosciutto di Parma need at least one year to age. Traditional balsamic vinegar takes at least 12 years, while the really good stuff clocks in at a minimum of 25 years—a whole generation. 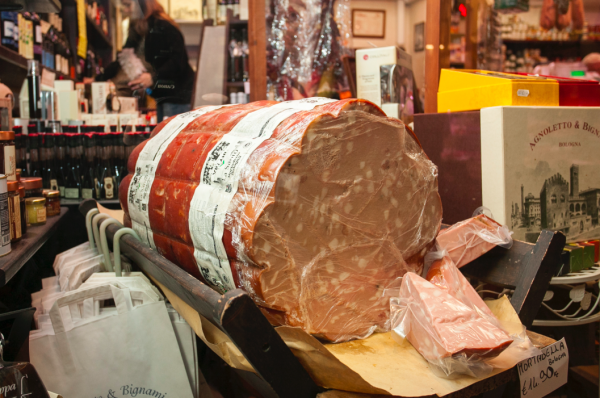 The ancients knew about these foods: Etruscans and Romans cured salted pork legs in the same area where it’s done today; Benedictine monks made Parmigiano-Reggiano in medieval times; and barrels of traditional balsamic vinegar served as brides’ dowries. 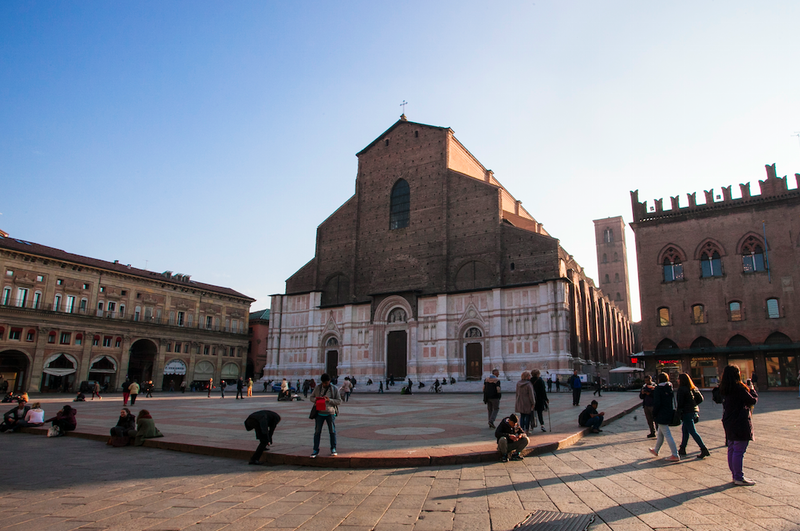 Emilia-Romagna isn’t what immediately comes to American travelers’ minds; a first-time visitor to the country is more likely to hit Tuscany. 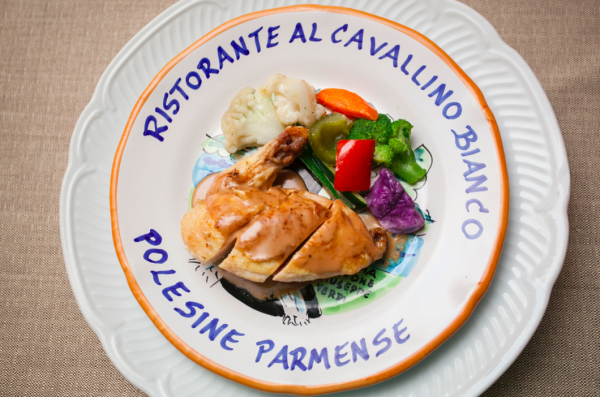 But look: you can eat a lot better here, in the fertile heartland of Italy. 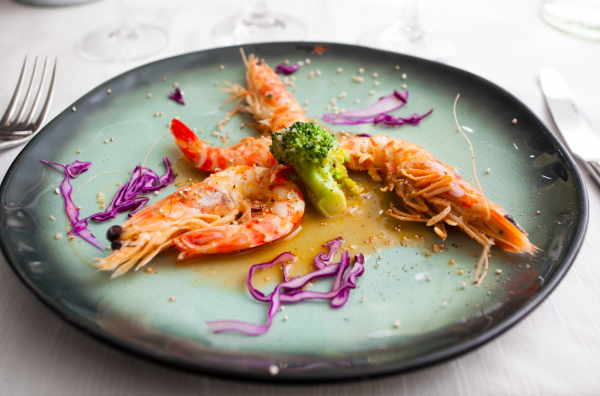 The region counts 41 products with PDO and PGI certification, and 50 DOC and DOCG wines—all signifiers of foods or drinks produced or processed in a particular area only—and for a bon vivant, those numbers can’t help but induce feverish, food-laden fantasies. The thread of history runs through these foods, and savoring them locally anchors you firmly in the continuum of history. 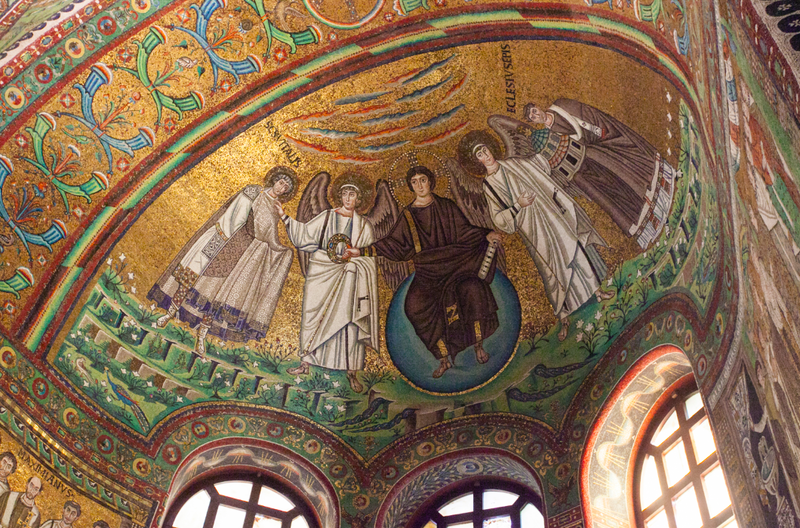 The mosaics of Ravenna, the one-time capital of the Western Roman Empire, glittering with gold, blues, and greens; the warm-hued porticoes of Bologna, which run over 25 miles; and the artistic legacy left here—where Verdi and Rossini composed, Dante finished “Paradiso” in his final days, and Fellini directed—are dizzying. At the confluence of art and food, the traditional foodways were captured by the artists of their time. Look closely: etched into bas-reliefs of Romanesque masterpieces, or painted onto Renaissance frescoes, are depictions of the rhythm of humans’ passage on Earth, marked by the seasons and its milestones—the ploughing of the fields, the harvest, and the curing of meats, for example. 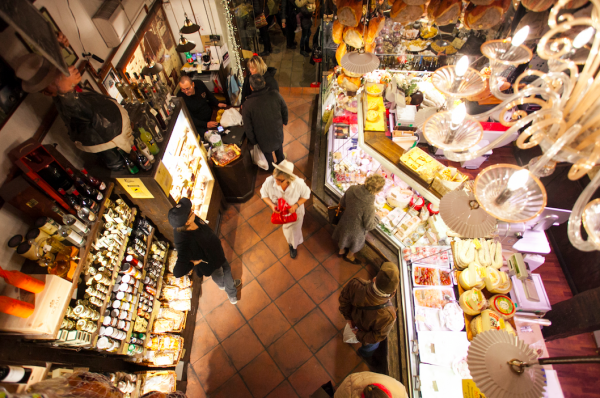 Emilia-Romagna offers amazing food in such a relatively small area. How is this possible? Explanations I was given varied—It’s the River Po! It’s the winter fog! It’s the wind from the sea! Clearly, all the elements conspire to make eating here great. Just follow the Via Emilia, constructed by Roman Consul Marcus Aemilius Lepidus (or in modern parlance, Route SS9). Like a bejeweled necklace of culinary gems, each area along the route offers its own specialties. 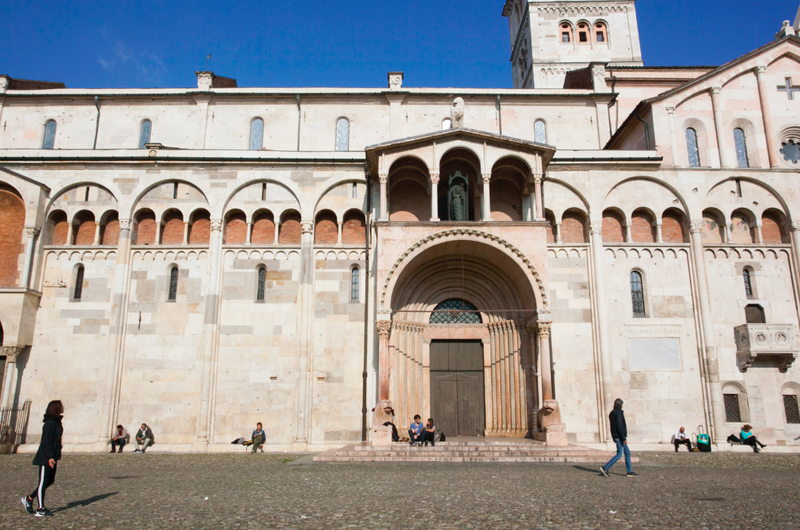 Parma, where the local dialect is heavy with French influence (listen to those r’s! ), and where Napoleon’s second wife found solace when he was sent into exile, is where I started my eating odyssey. 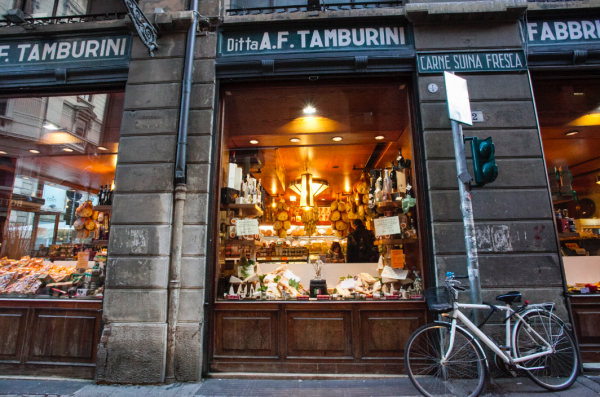 Here is the home of the famed prosciutto di Parma. Heading south of the city to Langhirano, where hills are dotted with about 160 factories and aging warehouses, I noticed one oddity as we drove along: the windows were thrown wide open. It’s intentionally done to capture the Versilia wind that comes in from the Ligurian Sea, then brushes against the Cisa mountains and picks up the fragrance of the chestnut forests. 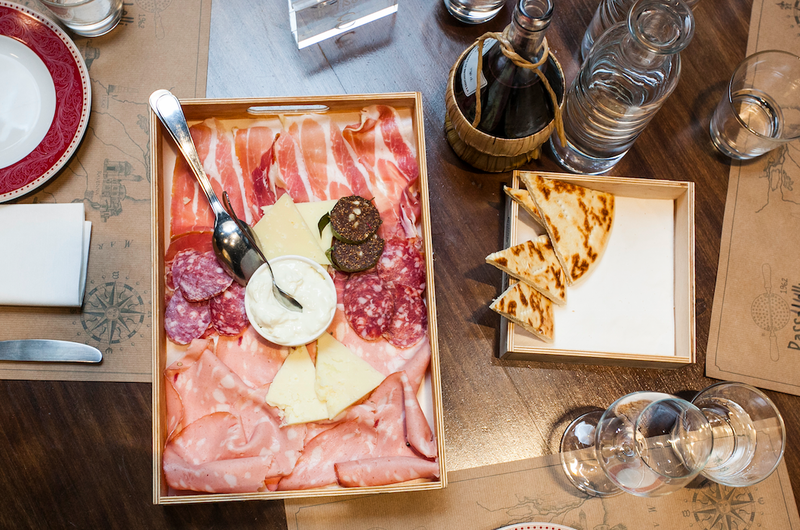 The location is no secret: even back in 5 B.C., the Etruscans were known to trade salted cured pork legs with the rest of Italy and Greece. 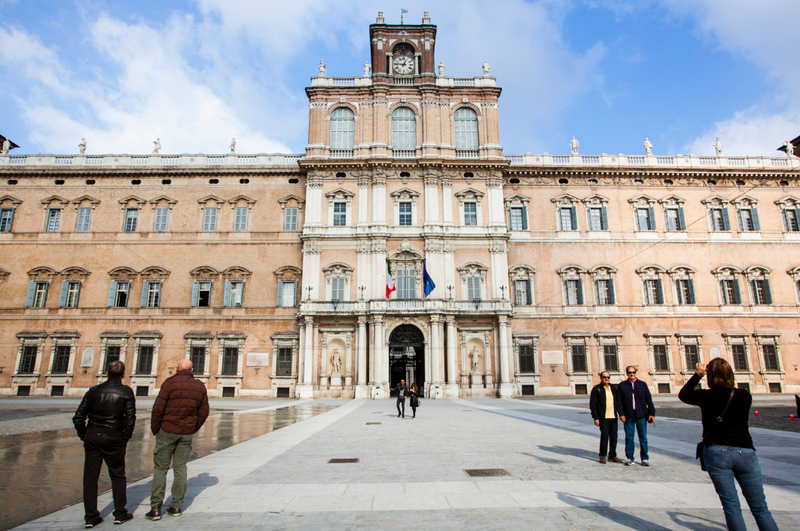 Not all producers are open to the public, so if you don’t speak Italian, going through a tour operator can be helpful for planning your visit. Ruliano, higher up in the hills, is one of those open to visitors. 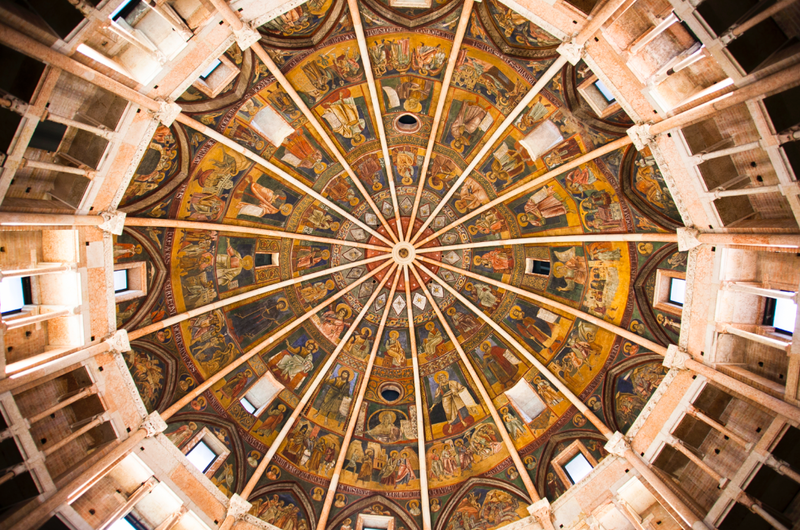 It recently built a reception center where visitors can taste the prosciutto. Stepping into the factory, I was immediately enveloped by a warm, sweet fragrance. 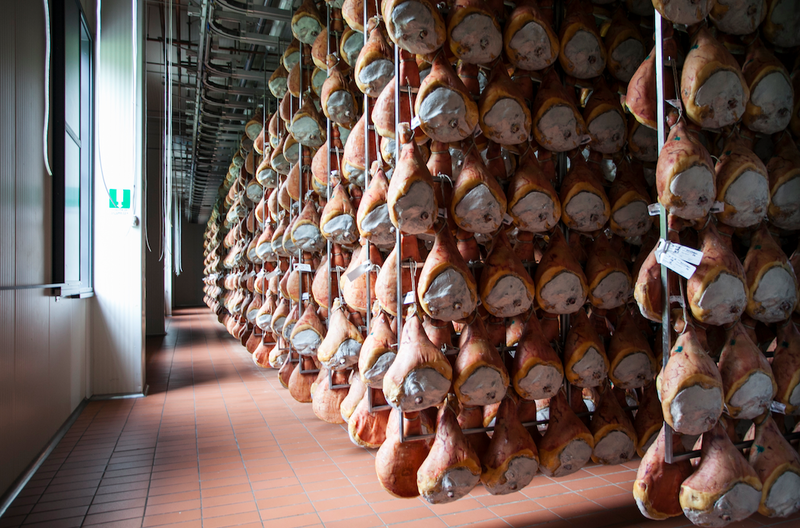 There are, according to the consortium regulating prosciutto di Parma, 10 stages of sweetness. Over a period of one to three years, hams are slowly cured, losing a quarter of their original weight. In the final stage, they hang in a room where the windows are indeed thrown wide open to the breeze. 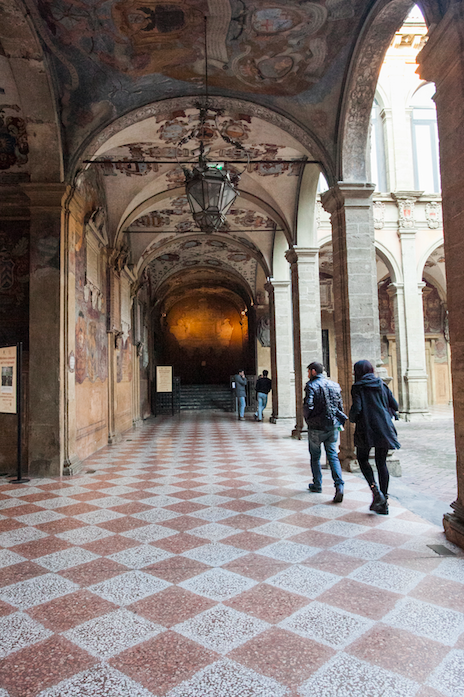 Burned into each ham is a branding mark: the ducal crown of Parma. Moist, sweet, and savory, silky smooth and translucent, the best of Parma hams are well-balanced. They need no accompaniment like melon or bread—just a glass of a local fizzy white or red. If you thought that Ligurian wind was a bit of poetic baloney, then try Culatello di Zibello, often dubbed “the king of hams.” There are only about 50,000 of these made each year, compared to about 9 million prosciutto hams; name tags show the eventual recipient (for example, Armani, Prince Charles, among others). You can’t import them into the United States due to FDA regulations, but that hasn’t stopped its devotees from smuggling it illegally (one person I know claimed it was a sculpture—and got it through). 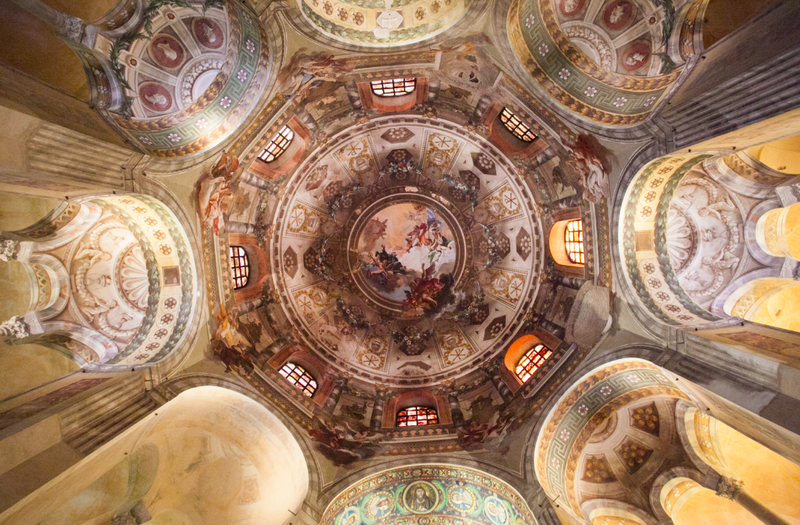 To find these, you need to head south into the humid lowlands, by the Po river. 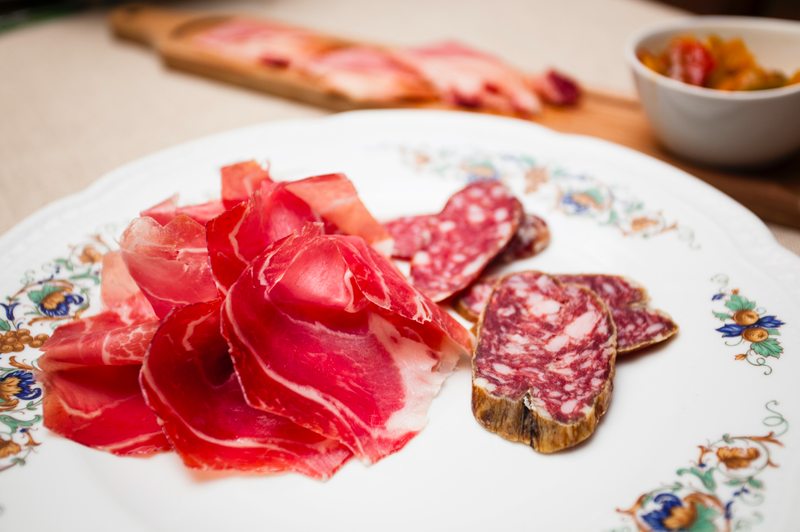 Chef Massimo Spigaroli has been championing and making culatello di Zibello for years, and the best place to find these is at the enchanting Antica Corte Pallavicina, a restored castle-hotel-restaurant-farm. 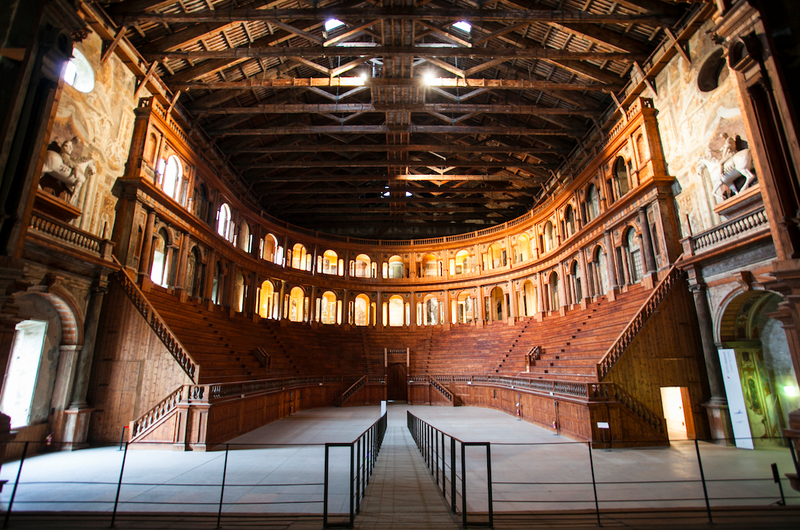 Stepping into the 14th-century fortress, I was immediately hit by the intoxicating smell wafting up from the cellars where the culatello is aged. Whereas artisanal prosciutto di Parma is cured in the sweetness of hill breezes and sees the light of the Emilian sun, these culatellos, pear-shaped and hung in pig bladders, mature in dark cellars. The lowlands’ humid fog, which enters the cellar at night, is crucial to creating the mold that will impart its own very particular flavors. Aged for at least 15 months, culatellos are made from both white pigs and black pigs, with the black pig being far more intense. The farm and fields yield everything you find on the restaurant menu. As I visited with sous-chef Antonio Montalto while he prepped some beautiful quince to make jam (from the orchard, of course), it struck me: these pigs eat better than most of us. They enjoy food that includes leftovers from a Michelin-starred restaurant. The culatello is ruby red and velvety, and its flavor is just like its fragrance: deeply primal and intense—so intense that it was a tad too much for me. It turns out there’s a wide world of charcuterie in Emilia-Romagna that you could devote a whole stay to chasing: salame di Felino (which has its own museum devoted to it), coppa piacentina (perfumed with cinnamon, cloves, bay leaves, salt, pepper, and nutmeg), pancetta flavored with red wine and garlic, and mellow mortadella from Bologna. For many who visit Emilia-Romagna, the biggest revelation is a dark, thick, molasses-like concoction, reputed to be a cure-all. Some call it “black gold.” Officially it’s Aceto Balsamico Tradizionale di Modena DOP. 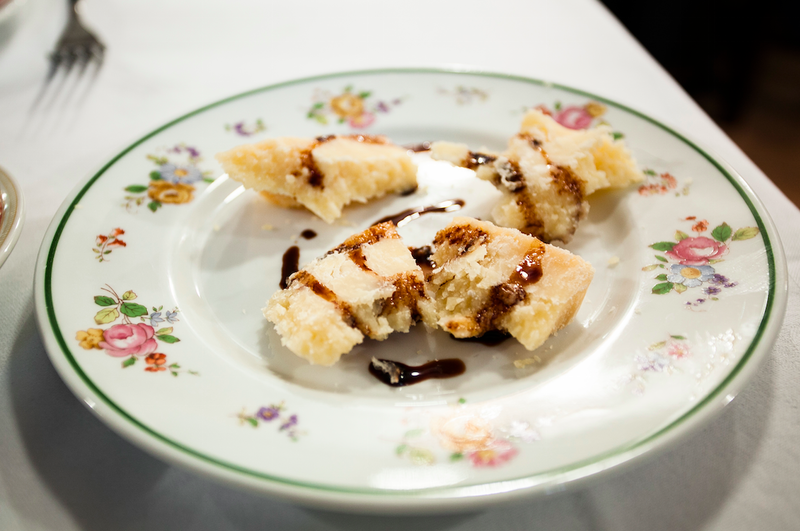 It’s balsamic vinegar, yes, but not the watery stuff. This is a vinegar that earns the DOP appellation after a minimum of 12 years of aging (it is then called “affinato” or aged) or else a minimum of 25 years (then called “extra vecchio” or extra old). It only comes in a 100-milliliter bottle, in a specific rounded shape designed by Giugiaro, a car designer. I visited Sofia Malagoli, whose family runs Aceitaia Malagoli Daniele in Castelfranco Emilia, just outside Modena. In her farmhouse, she led me to the attic and it was filled with wooden barrels—big barrels, medium barrels, small barrels—with a small opening covered with cloth. 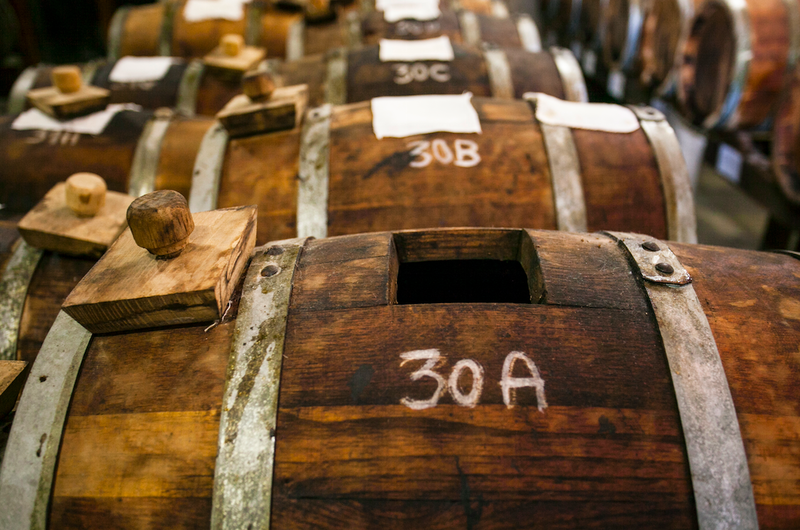 To make traditional balsamic vinegar, you might start with 30 liters of grape must, which in several years’ time will yield 5 liters of thick balsamic vinegar. 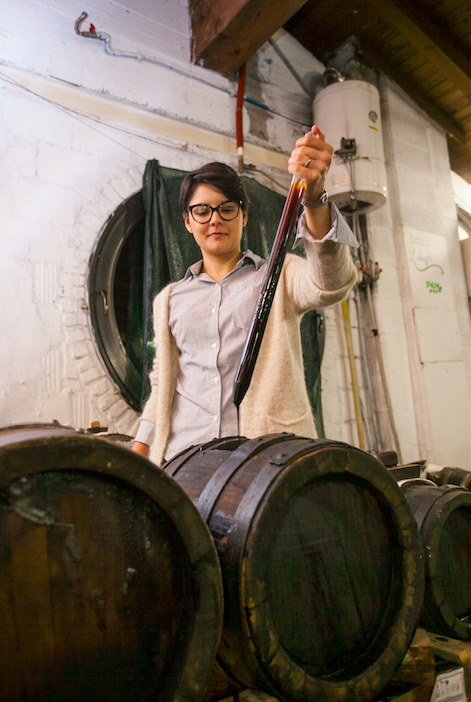 During that time, the balsamic vinegar is tempered by the extremes in temperature—cold winters, hot summers—and a portion from each barrel will be moved to a smaller barrel. 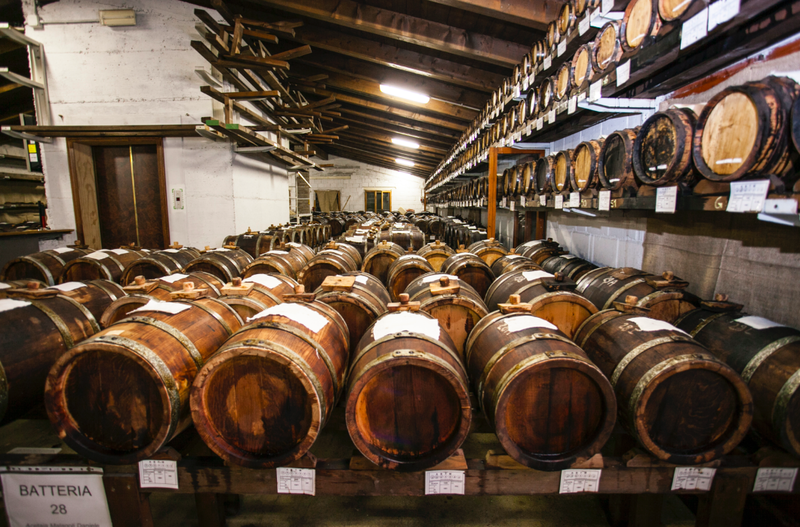 The barrels are made with different woods, which impart color and flavor: cherry, acacia, mulberry, oak, and chestnut. The end product is nothing like standard vinegar. There’s zero acridity. It’s sweet and sour, but also rounded, harmonious, and polished. You only need a few drops of it—on chunks of Parmigiano-Reggiano, on meats, on ice cream, on strawberries, on risotto, or by itself as a digestive. Whenever I have a few drops on a spoon, I feel a bolt of energy coursing through my body. Miracle cure? I don’t know about that, but it tastes amazing. 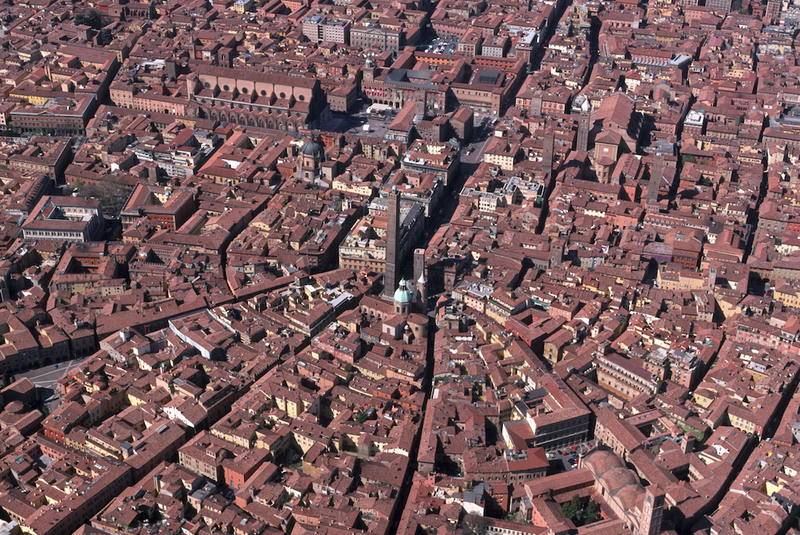 In Bologna, just behind the major Piazza Maggiore, there is an area called the Quadrilateralo, the site of a market that has been in pretty much the same location since Roman times. The shops are almost all devoted to food. The neighborhood especially comes alive at sundown; against the darkness of night, the mounds of tortellini glow like gold, and the produce seems almost fluorescent. 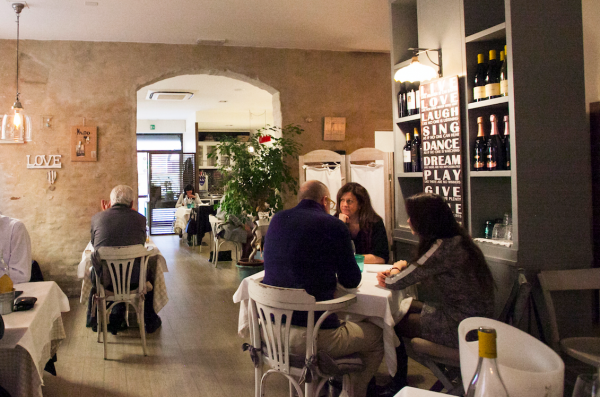 People suddenly seem to flock to its small streets: it is time for aperitivo. Aperitivo is one of those wonderful traditions where Italians have an excuse to scurry off to a bar, after work to meet friends over wine, and savor those cured meats and cheeses that are often accompanied by simple breads that are made quickly (and that you must also eat quickly, while warm), like tigelle, piadina, or gnocco fritto,—squares of dough that puff up when fried. 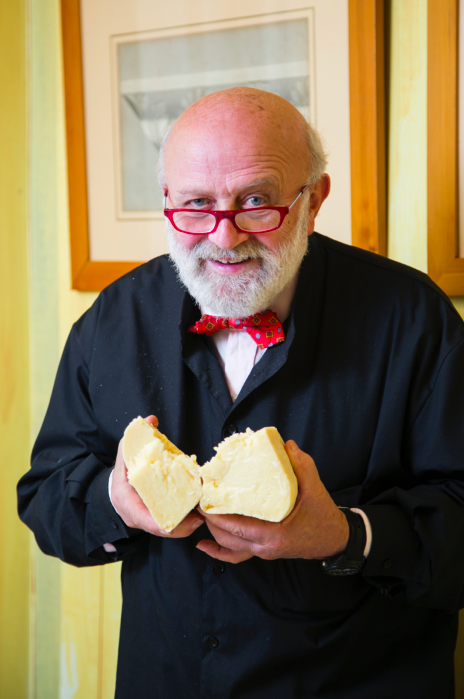 On the plate there are always chunks of Parmigiano-Reggiano, called the “king of cheeses.” Food here is often named like royalty, which says a lot about the reverence given to the craft. It takes 600 liters of milk and a couple of years to make one wheel of Parmigiano-Reggiano. The longer it’s aged, though, the more flavorful it becomes, and the more of those delicious crystals you get (those are an amino acid called tyrosine, which crystallizes in high concentrations). 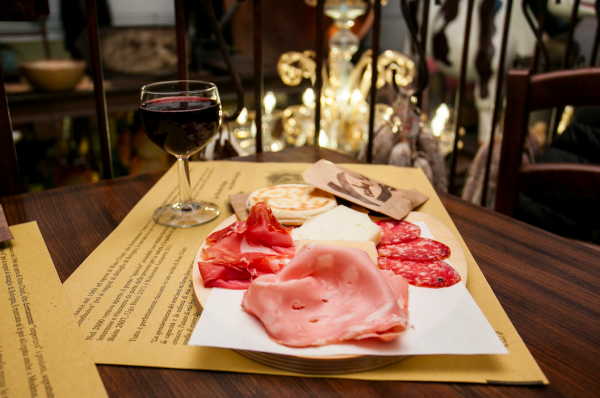 In Bologna, stop by La Baita Formaggi for aperitivo. Downstairs it sells salumi and cheeses to go, but you can head upstairs, where it’s cozy, and order light bites and drinks. 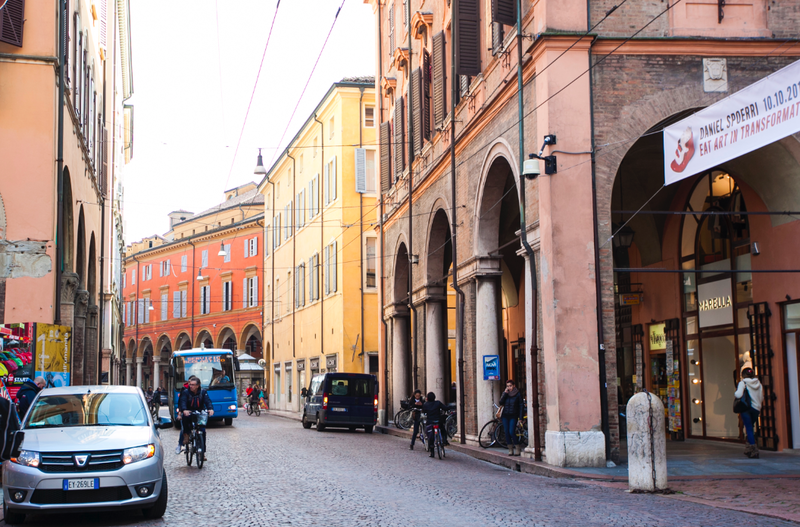 Many of the buildings in cities along the Via Emilia are painted in warm colors: shades of orange, ochre, and yellow. Parma yellow is supposedly famous, but the historic Modena yellow was ushered into modern times by Enzo Ferrari, who chose it for the background to his prancing horse logo. When you’ve eaten enough along the Via Emilia, though, you realize that yellow starts to look very familiar. It’s also the color of the famed fresh egg pasta, made with whole eggs. 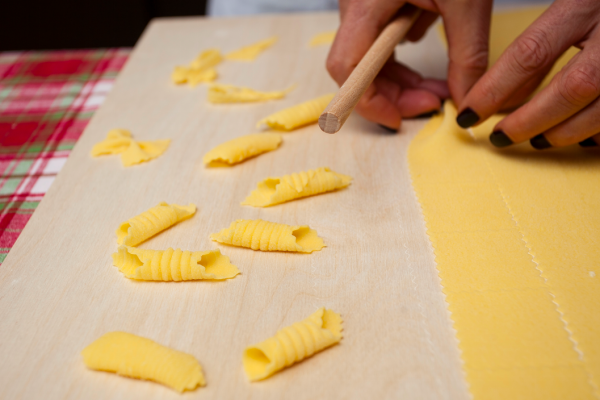 Making sfoglia—sheets of egg pasta—is a craft. There are shortcuts like using a pasta machine, but traditionally it’s made with a 3-foot-long wooden rolling pin (it’s amazing how far dough from a bit of flour and a couple of eggs will stretch), on a wooden board. Not only does it give the pasta that wonderful rough texture that sauce can cling to, but the dough is also stretched rather than compacted—making for a light, ethereal texture. 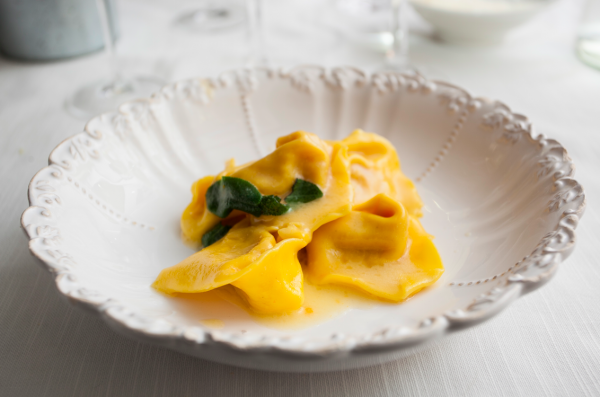 Fresh pasta abounds throughout the region. 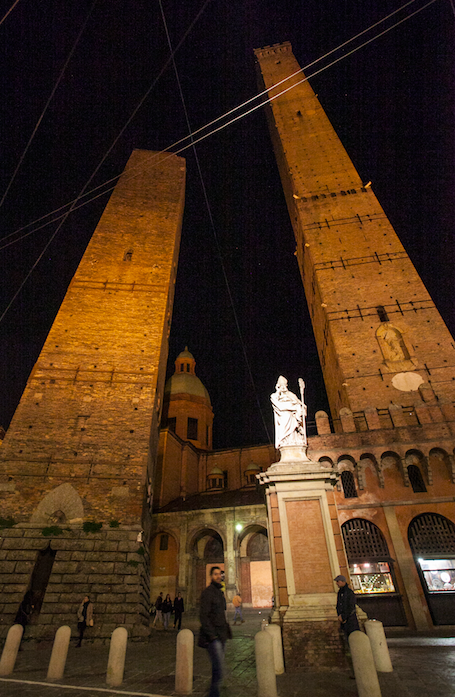 Lasagna was born in the city of Bologna (Bologna La Grassa is its nickname—la grassa meaning fat or rich). as well as “tagliatelle al ragù,” a dish that morphed into spaghetti bolognese in foreign lands. The width of tagliatelle, it was decreed, should be 1/12,270 of the height of the city’s Asinelli Tower, in other words, 8 millimeters when cooked, and 6.5 to 7 millimeters when cut. Somewhere along the way, a genius figured out that pasta could be stuffed or filled, and that’s where Emilia-Romagna really shines. 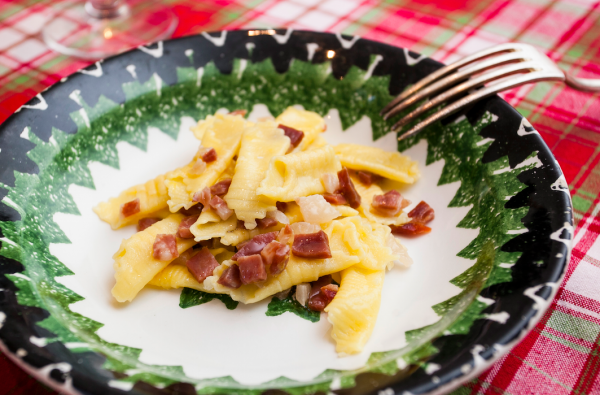 There are variants of fresh stuffed egg pasta in some form or another in the region, including the tiny tortellini, filled with mortadella, pork, veal, and Parmiggiano-Reggiano, served in a capon broth. It’s big taste in a small package; local lore dictates that tortellini should be small enough that 7 or 8 uncooked ones would fit on a spoon. Skilled hands that may not seem the most delicate can be amazingly adept in folding these. The good signora at Trattoria Anna Maria in Bologna is one of those skilled chefs; she has been doing it for at least 30 years. 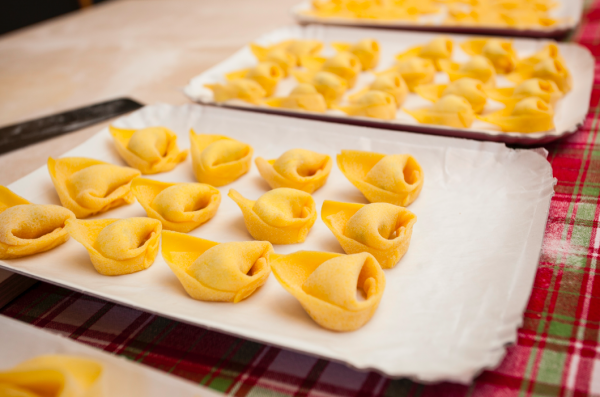 To demonstrate how tortellini are made, she took a square of paper and in one fluid, quick movement, folded it into a tortellini shape. I am certain she could have done it in her sleep. 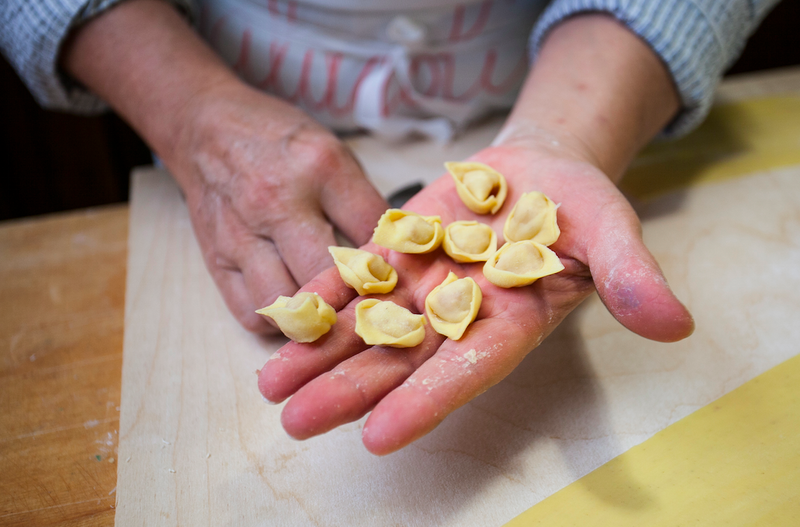 Legend has it that the tortellini was invented when an innkeeper caught a glimpse of the navel of Venus (or Lucrezia Borgia, depending on the story) and became so enamored, he hurried off to create these little pasta shapes. 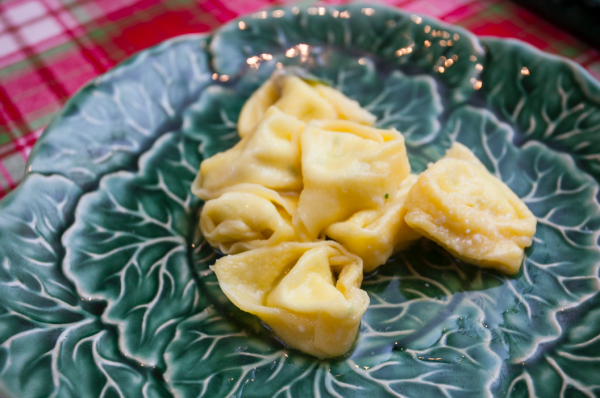 There are also the larger tortelloni, filled with fresh ricotta, and spinach. These are so iconic that you’ll find the shape repeated again and again. In Bologna, chocolate maker Majani, which has been in business since 1796, and was the first in Italy to create solid chocolate with its crumbly Sfoglia Negra in 1832, makes tortellini-shaped chocolates. Artisanal leather workshop La Vachetta Grassa in Modena, which works with vegetable-tanned leather, makes leather tortellini. 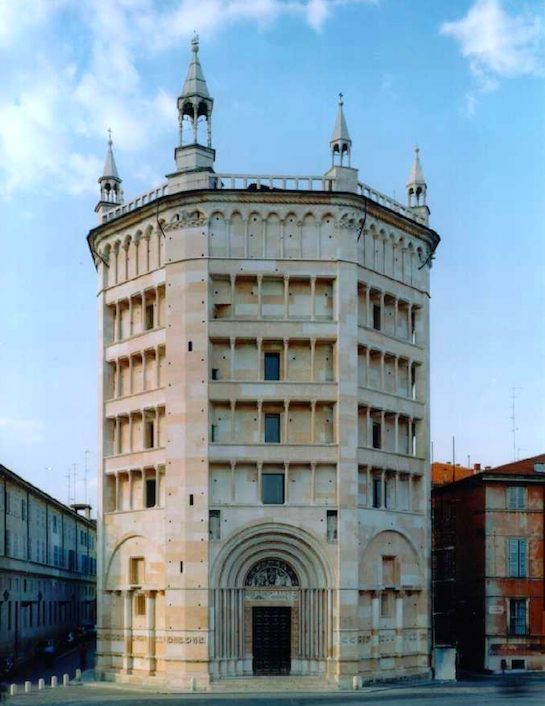 And then there’s a hat-shaped variant from the town of Ferrara, called cappellaci. If you ask my inexpert opinion, I’d tell you it looks suspiciously like a tortellini. But who am I to get in the way of city pride? What is distinctly different are the Cappellaci di Zucca Ferrerese, which were made as far back as the Renaissance and have that telltale sweet-savory combination that people were so fond of in those times. Filled with local violin-shaped pumpkin, Parmigiano-Reggiano or Grana Padano, and pinches of salt, pepper, and nutmeg, then cooked and tossed in butter and sage, they taste positively transcendent (the version at Ferrara’s Trattoria Le Nuvole is incredible). The best thing about this kind of pasta is that all the flavors are just waiting to burst forth in your mouth. You can have a good meal at a restaurant, but really, if there’s something the Italians go on and on about, it’s cooking at home. So if you really want a great meal, eat at an Italian home. To do that, I joined a pasta-making class offered by Cristina Fortini and Monica Parisi of Italy Food Nest. It was held at Fortini’s apartment, overlooking a street in Bologna. The premise is simple: full Italian immersion takes place at the dining table, and there are options for tours, dining, or cooking lessons in various Italian cities, hosted by locals. I’d eaten so much great pasta over the previous several days that I was eager to learn some skills to take back home with me. And I was curious to see how pasta made at home might shake out against their restaurant versions. “We are Italians, we are maniacs about pasta,” Fortini said. My pasta-making teacher Monica Parisi makes fresh pasta for a living, five days a week, six hours a day, and she makes it look easy. When it came time for me to take the rolling pin to the dough, I was surprised at how resistant the dough was. The dough, which had been nothing but a small golden ball made with flour and eggs, grew and grew flatter, wider, longer, in a rather uneven way. The sheet of dough hung off the table at one point, and I was having to press against it with my leg while rolling the dough. Apparently, that’s okay. Fortini and Parisi were gentle and encouraging: I needed to keep going, and the dough needed to get thinner. Out of the dough, we made tagliatelle (no one brought a ruler to check for the requisite 8 millimeters, thankfully), as well as garganelli and tortelloni. For all those folks making coloring books bestsellers, I can only say to you, you must try making pasta. There’s a fun, even meditative quality to it. In the end, Fortini and Parisi were beaming like proud mothers; Fortini brought the pastas into the kitchen and made the most delicious tagliatelle al ragù I’d had during my stay, as well as superb garganelli with pancetta and lemon zest, and wonderful tortelloni filled with ricotta. For dessert, she brought out a traditional delicacy from Ferrara that she’d made: tenerina, a heavenly chocolate cake, light as a cloud. That’s Emilia-Romagna. When you don’t think it can possibly get any better, it does. 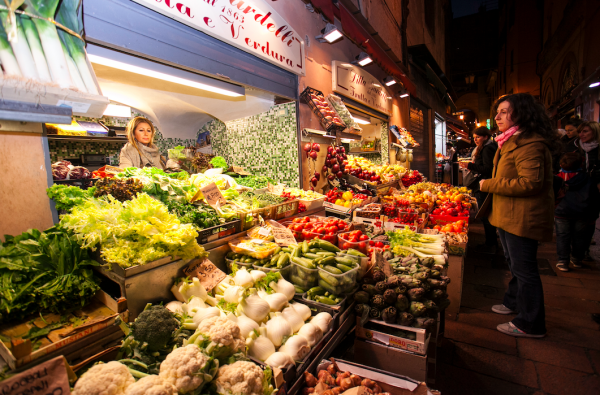 Foods made from ingredients as humble as milk, flour, eggs, or grapes are transformed with patience and skill into culinary gems of such goodness they’ve reached far beyond this little heartland of Italy into kitchens and markets around the world. You could, in all likelihood, just head to your local market and get Parmigiano-Reggiano, or prosciutto di Parma, or balsamic vinegar or tortelloni there. Will they be as good as the ones you can have in Emilia-Romagna, though? There’s only one way to find out. 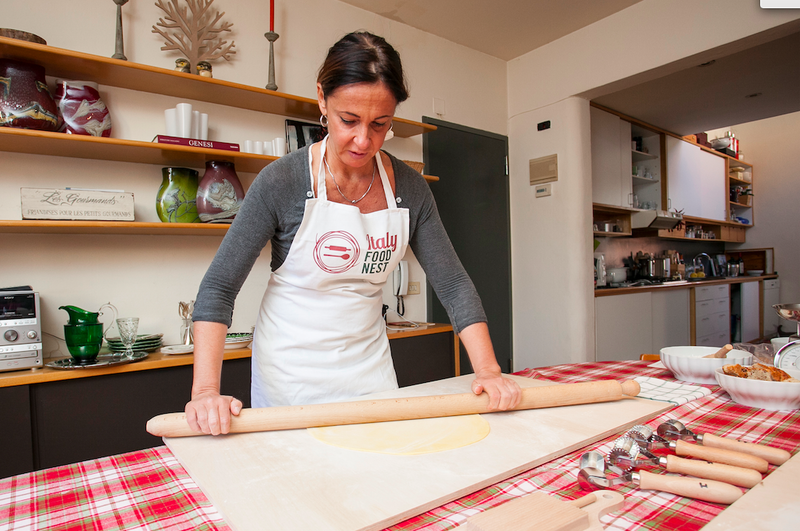 Tour de Forks, a boutique culinary travel company that subscribes to the principles of the Slow Food movement, offers custom tours of Emilia-Romagna. It’ll arrange hotel accommodations, a private car or self-drive rental car, tastings, and tours, according to your preferences. Oldways is a nonprofit organization focused on cultural food traditions and good health. From May 1 to May 8, James Beard award-winning chef Barbara Lynch and museum curator Ronni Baer from the Museum of Fine Arts in Boston will guide an exploration of the region, through cooking classes, art tours, wine tastings, and visits to food producers. 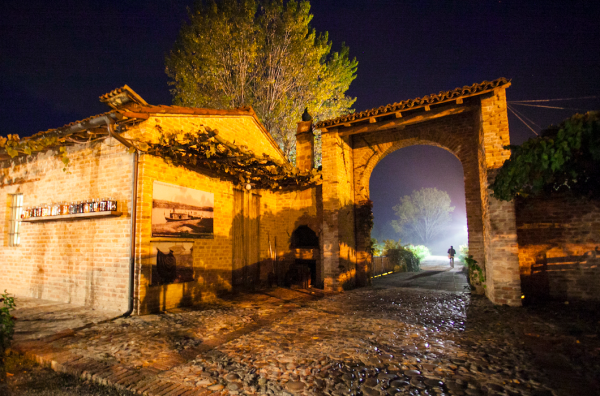 Polesine Parmense: Antica Corte Pallavicina Relais is a fortress from the 14th century that houses a restaurant and farm that happens to have six elegant guest rooms. 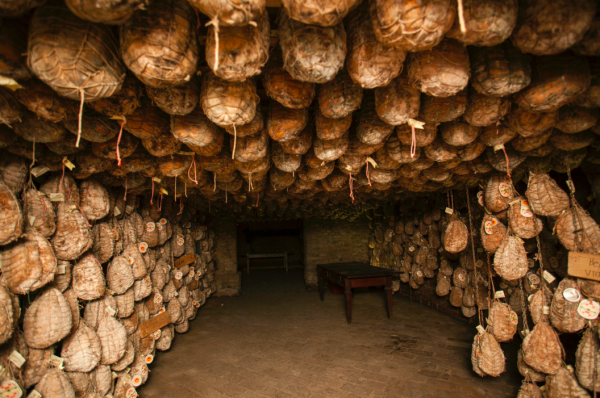 Culatello is aged in the cellars. Strada del Palazzo Due Torri, 3. 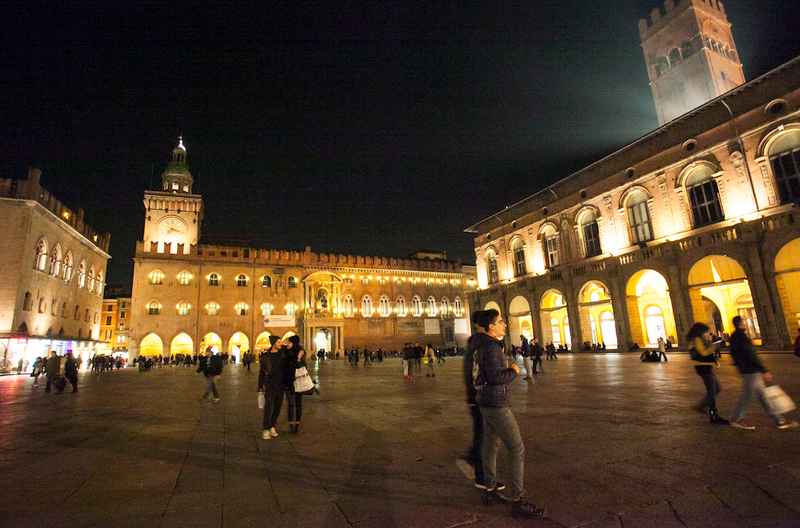 Bologna: Hotel Orolologio is located steps away from the bustling heart of town, Piazza Maggiore. Via IV Novembre, 10. Modena: Best Western Premier Milano Palace is modern and convenient. C.so Vittorio Emanuele II, n.68.